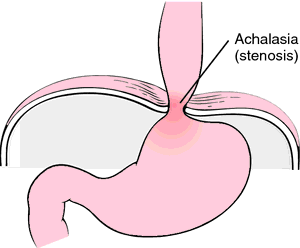 Achalasia is a disorder of the esophagus that prevents normal swallowing. Achalasia affects the esophagus, the tube that carries swallowed food from the back of the throat down into the stomach. A ring of muscle called the lower esophageal sphincter encircles the esophagus just above the entrance to the stomach. This sphincter muscle is normally contracted to close the esophagus. When the sphincter is closed, the contents of the stomach cannot flow back into the esophagus. Backward flow of stomach contents (reflux) can irritate and inflame the esophagus, causing symptoms such as heartburn. The act of swallowing causes a wave of esophageal contraction called peristalsis. Peristalsis pushes food along the esophagus. Normally, peristalsis causes the esophageal sphincter to relax and allow food into the stomach. In achalasia, which means "failure to relax," the esophageal sphincter remains contracted. Normal peristalsis is interrupted and food cannot enter the stomach. Achalasia is caused by degeneration of the nerve cells that normally signal the brain to relax the esophageal sphincter. The ultimate cause of this degeneration is unknown. Autoimmune disease or hidden infection is suspected. Dysphagia, or difficulty swallowing, is the most common symptom of achalasia. The person with achalasia usually has trouble swallowing both liquid and solid foods, often feeling that food "gets stuck" on the way down. The person has chest pain that is often mistaken for angina pectoris (cardiac pain). Heartburn and difficulty belching are common. Symptoms usually get steadily worse. Other symptoms may include nighttime cough or recurrent pneumonia caused by food passing into the lower airways. Esophageal manometry. In this test, a thin tube is passed into the esophagus to measure the pressure exerted by the esophageal sphincter. X ray of the esophagus. Barium may be swallowed to act as a contrast agent. Barium reveals the outlines of the esophagus in greater detail and makes it easier to see its constriction at the sphincter. Endoscopy. In this test, a tube containing a lens and a light source is passed into the esophagus. Endoscopy is used to look directly at the surface of the esophagus. This test can also detect tumors that cause symptoms like those of achalasia. Cancer of the esophagus occurs as a complication of achalasia in 2-7% of patients. The first-line treatment for achalasia is balloon dilation. In this procedure, an inflatable membrane or balloon is passed down the esophagus to the sphincter and inflated to force the sphincter open. Dilation is effective in about 70% of patients. Three other treatments are used for achalasia when balloon dilation is inappropriate or unacceptable. Botulinum toxin injection. Injected into the sphincter, botulinum toxin paralyzes the muscle and allows it to relax. Symptoms usually return within one to two years. Esophagomyotomy. This surgical procedure cuts the sphincter muscle to allow the esophagus to open. Esophagomyotomy is becoming more popular with the development of techniques allowing very small abdominal incisions. Drug therapy. Nifedipine, a calcium-channel blocker, reduces muscle contraction. Taken daily, this drug provides relief for about two-thirds of patients for as long as two years. Most patients with achalasia can be treated effectively. Achalasia does not reduce life expectancy unless esophageal carcinoma develops. There is no known way to prevent achalasia. Grendell, James H., Kenneth R. McQuaid, and Scott L. Friedman, editors. Current Diagnosis and Treatment in Gastroenterology. Stamford: Appleton & Lange, 1996. Botulinum toxin — Any of a group of potent bacterial toxins or poisons produced by different strains of the bacterium Clostridium botulinum. The toxins cause muscle paralysis. Dysphagia — Difficulty in swallowing. Endoscopy — A test in which a viewing device and a light source are introduced into the esophagus by means of a flexible tube. Endoscopy permits visual inspection of the esophagus for abnormalities. Esophageal manometry — A test in which a thin tube is passed into the esophagus to measure the degree of pressure exerted by the muscles of the esophageal wall. Esophageal sphincter — A circular band of muscle that closes the last few centimeters of the esophagus and prevents the backward flow of stomach contents. Esophagomyotomy — A surgical incision through the muscular tissue of the esophagus. Esophagus — The muscular tube that leads from the back of the throat to the entrance of the stomach. Peristalsis — The coordinated, rhythmic wave of smooth muscle contraction that forces food through the digestive tract. Reflux — An abnormal backward or return flow of a fluid. failure to relax of the smooth muscle fibers of the gastrointestinal tract at any junction of one part with another. Especially failure of the lower esophagus to relax with swallowing, due to degeneration of ganglion cells in the wall of the organ. The cause is unknown, but anxiety and emotional tension seem to aggravate achalasia and precipitate attacks. As the condition progresses there is dilatation of the esophagus (megaesophagus) above the constriction and loss of peristalsis in the lower two-thirds of the organ. Symptoms. The patient complains of progressive dysphagia and a feeling of fullness in the sternal region; vomiting frequently occurs, and there may be aspiration of the esophageal contents into the respiratory passages. As a result of this aspiration the patient may develop pneumonia or atelectasis. Diagnosis is confirmed by manometric readings, which document motor dysfunction. Treatment. Conservative treatment of mild cases consists of advising the patient to eat a bland diet that is low in bulk. Very large meals should be avoided and all foods should be eaten slowly with frequent drinking of fluids during the meal. To reduce the possibility of aspiration of esophageal contents during sleep, the patient is instructed to sleep with the head and shoulders elevated. A nonsurgical method for treating resistant cases is repeated dilation of the esophageal sphincter by means of a bougie or by a pneumatic bag that is guided into place under x-ray visualization. As a last resort surgical intervention may be necessary. An incision, which includes the lower esophagus and upper stomach wall, is made down to but not through the intestinal mucosa. This allows for stretching of the mucosa to accommodate food passing through. Approach is made through an incision into the chest; thus, preoperative care and postoperative care are the same as for elective chest surgery (see thoracic surgery). Failure to relax; referring especially to visceral openings such as the pylorus, cardia, or any other sphincter muscle. /ach·a·la·sia/ (ak″ah-la´zhah) failure to relax of smooth muscle fibers at any junction of one part of the gastrointestinal tract with another, especially failure of the esophagogastric sphincter to relax with swallowing, due to degeneration of ganglion cells in the wall of the organ. The failure of a ring of muscle fibers, such as a sphincter of the esophagus, to relax. an abnormal condition characterized by the constriction of the lower portion of the esophagus because of the inability of a muscle to relax (cardiospasm), particularly the lower esophageal sphincter. Compare corkscrew esophagus. See also dysphagia. A dysmotility disorder characterised by a loss of peristalsis in the distal 2⁄3 of the oesophagus accompanied by impaired relaxation of the lower oesophageal sphincter. Idiopathic, possibly autoimmune; secondary to neoplasia, vagotomy, sarcoid, MEN2A. Dysphagia, chest pain, vomiting, heartburn. Plain films, air-fluid level in enlarged oesophagus, barium swallow, bird’s beak tapering and, if prolonged, sigmoid oesophagus. Pneumatic dilation of oesophagus; medication (e.g., nitroglycerin, CCBs (e.g., nifedipine); surgery (e.g., Heller myotomy). Short-term (maximum 12-month) response is achieved with intrasphincteric injection of botulinum toxin. GI disease An idiopathic dysmotility disorder, characterized by a loss of peristalsis in the distal 2⁄3 of the esophagus accompanied by impaired relaxation of the lower esophageal sphincter Clinical Dysphagia, chest pain, vomiting, heartburn Imaging Plain films, air-fluid level in an enlarged esophagus; barium swallow, bird's beak tapering and, if prolonged, sigmoid esophagus Management Pneumatic dilation of esophagus; medication–eg nitroglycerin, CCBs–eg, nifedipine; surgery–eg, Heller myotomy. See GERD. Failure to relax; referring especially to visceral openings such as the pylorus, cardia, or any other sphincter muscles. Failure of a muscle ring (SPHINCTER) to relax when it should. Achalasia most commonly affects the sphincter at the bottom of the gullet (OESOPHAGUS). See also ACHALSIA OF THE CARDIA. Failure to relax; referring especially to visceral openings. 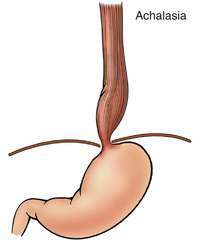 failure to relax of the smooth muscle fibers of the gastrointestinal tract at any junction of one part with another; especially failure of the lower esophagus to relax with swallowing, due to an abnormality of innervation. Called also cardiospasm. See also megaesophagus. failure of the cranial esophageal sphincter to relax during swallowing to accommodate the approaching bolus. Gagging, nasal regurgitation and aspiration result. Called also cricoesophageal incoordination. is motor dysfunction of the cricopharyngeal sphincter in which a failure of relaxation prevents the bolus from entering the esophagus during swallowing. Called also cricopharyngeal dysphagia. failure of the pylorus to open in neonates so that distention of the stomach occurs and causes continuous vomiting. This may be reflex in response to local ulceration, e.g. in young calves, or be a congenital defect. is probably a factor in the development of the gut stasis in bovine vagal indigestion with onward passage of ingesta obstructed at the exit from the rumenoreticulum. Results in rumen distention and frothiness of contents. Al haber sido valorada se decidio realizar un esofagograma que reporto dificultad del paso del medio de contraste en el tercio distal del esofago y union gastroesofagica (UEG), estenosis filiforme que obliteraba el 95% del calibre normal a ese nivel, ademas de dilatacion esofagica relacion 4:1 en todo el trayecto, por lo que se catalogo como recurrencia de acalasia. La manometria reporto alteraciones motoras primarias y secundarias en el esfinter esofagico inferior (EEI) con presion basal de 25 mmHg, relajacion incompleta en el 50%, presion residual de 19 mmHg, 100% de contracciones aperistalticas, simultaneas, interrumpidas, no progresivas y no propulsivas, compatible con acalasia con compresion esofagica de la nueva clasificacion de Chicago. El estudio de un paciente con sospecha de acalasia consiste en identificar la funcion del EEI y las caracteristicas del resto del esofago por lo que el estudio diagnostico considerado estandar de oro es la manometria esofagica; mientras el tratamiento quirurgico mediante MH es considerado el procedimiento de eleccion, este tiene un caracter paliativo ofreciendo mejoria en los sintomas con minimas consecuencias y buenos resultados a largo plazo. publicaron evidencia sobre la relacion directa entre la estasis alimenticia en los pacientes con acalasia y la esofagitis cronica. En 2012 se publico una serie retrospectiva de 66 casos tratados por primera vez por acalasia. El grupo de la Universidad Jikei en Tokio, publico en 2012 una serie de 299 casos de pacientes con acalasia compilados durante el periodo de 1994 a 2010 que fueron sometidos a miotomia de Heller con funduplicatura tipo Dor laparoscopico (MHD) con endoscopia transquirurgica. Palabras claves: Acalasia, Cardiomiotomia, Da Vinci. En las dilataciones neumaticas que se efectuan en el tratamiento de la acalasia se ha descrito una tasa de perforacion de 4% a 6% cuando se efectua con presiones mayores de 15 mm Hg.